When ToursByLocals staff travel, whether for business or pleasure, we always make an effort to meet our guides. We consider it a pretty huge perk of the job to have a global network of friendly, knowledgeable local experts at our fingertips. Last weekend, I (Sara Cooke, the company's Director of Communications) was in London to exhibit at a travel show. With a similar show to attend the following weekend in Boston, it didn’t make sense to fly back to Vancouver. With a few extra days at my disposal, I could have stayed in London – a city I love, but know well – or spread my wings a bit and head somewhere new… and meet someone new! It didn’t take long to decide. As I write, I’m on a Wizzair flight returning to London after a 48-hour jaunt to Budapest, where I had the good fortune to meet Balint, a licensed guide and 5-star ToursByLocals partner since 2014. Balint pulled up in front of my hotel in his BMW a few minutes before 10am on my first full day in Budapest, ready to take this low-season visitor (and her tag-along sister) for a 3-hour driving and walking tour of his city. We gave Balint free rein to show us all his favourite spots, and – despite the cold, drizzly weather – we cheerfully set off to explore together, smiles on, umbrellas at the ready. While of course 3 hours isn’t enough time to see everything in Budapest, I was amazed at how much we DID see. There’s no doubt in my mind that a private tour is the way to go when you’re short on time! Balint showed us the highlights on both sides of the Danube (Buda and Pest). We took in the view from the Citadel on Gellert Hill, and explored the “Var” (Castle District), taking time to walk along Fisherman’s Bastion and look inside Matyas Church, where Balint’s insightful commentary turned it into more than just a pretty cathedral. On the Pest side of the river, we wandered the Parliament Square, seeing up close the buildings we’d been gazing at across the river all morning, before driving along Andrassy Avenue to Heroes’ Square to see where the nation had celebrated its 1000th anniversary in 1896. Some of my favourite details were the personal ones that came out throughout our tour. We saw where Balint went to high school, and ate at one of his favourite vegetarian restaurants for lunch (a great option for non-meat eaters who still want to try goulash!) 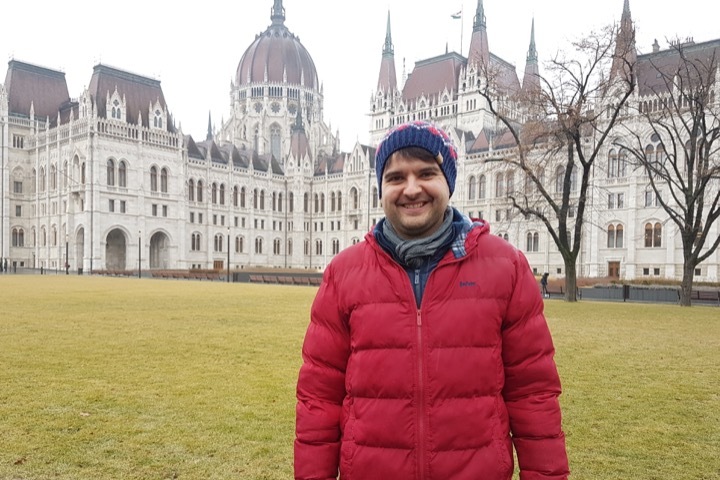 With his background in sociology, Balint gave us fantastic insight into what it was like for he and his friends to grow up in a formerly communist state, what life had been like for his parents and grandparents, and how the past continues to affect Hungarians today. I came away with a deep respect for the many poets, artists, musicians and thinkers whose insistence on preserving and developing Hungarian culture kept it intact through centuries of foreign rulers. I only had 2 days in Budapest, and spending 3 hours of that time with Balint was the best choice I made. Anyone else heading to Budapest? Don’t miss out on booking this 5-star tour experience.